Our FlowerColor Eyeshadow Refills contain Flower wax enriched formulas to prevent moisture from migrating from the skin, helping colors to glide on smooth and stay true throughout the day. Eyeshadow refills are naturally preserved. Gluten-free & vegan. Here’s a cool thought – Try a lighter color as an eyeliner or to highlight the center of your eyelid. Use darker colors to define an area and add depth, such as the crease or the outer corners or your eyes. How stunning! Flower wax is one of nature’s best-kept beauty secrets. The same delicate coating that protects flower petals from the elements is infused in our FlowerColor Mineral Make Up, to shield and enhance your beauty. 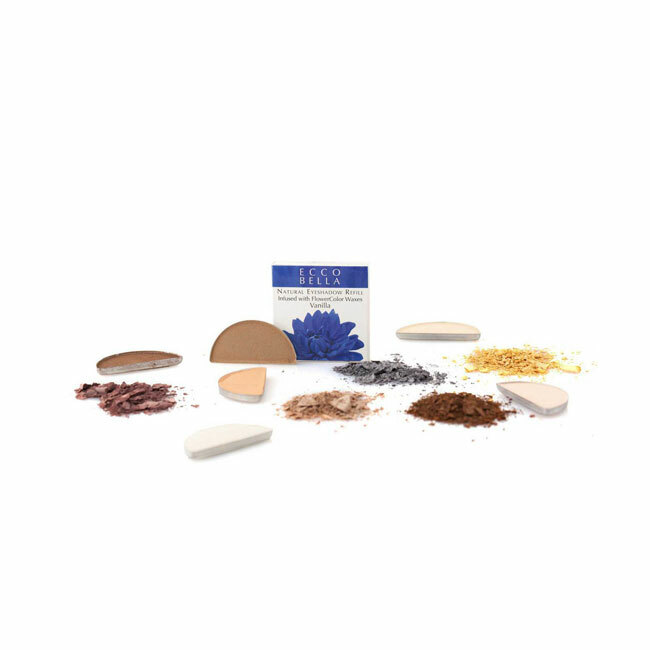 No toxins or chemicals to dry and irritate skin, only a pure mineral enriched formula along with the best natural ingredients.